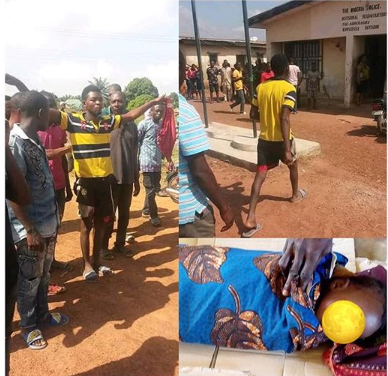 The man who slaughtered his 9 months old daughter, on Tuesday, in Mbangur, Benue State, as a sacrifice to God, has been pictured walking majestically to the police station. Yesterday, we reported how suspect identified as John Depuun, snatched the baby from his wife, took her to a bush where he killed her. He was later arrested by policemen attached to the Tse-Agberagba Division. During interrogation, Depuun admitted to killing the baby, but said he did as instructed by God. According to him: “It is my sheep and I decided to sacrifice it to God as demanded of me. I have not laid my hands on anyone's child and as such, should not be condemned.” He also denied speculations that he is battling mental illness. However, his family alleged his change in attitude in recent days. They revealed that he had informed them of his decision to deepen his involvement in the Confraternity of the Most Holy Rosary, a society in the Catholic church.